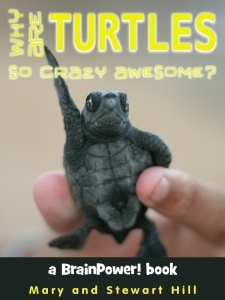 Children’s Ebook Review- Why Are Turtles So Crazy Awesome? Why Are Turtles So Crazy Awesome? Book Overview: Did you know that turtles have been around since the time of dinosaurs? Or that pictures of turtles have been found on ancient cave walls? Have you ever seen a turtle that protects itself by being so stinky that other animals don’t try to eat it? What about the turtle that uses a flap in its mouth as a fishing lure? Mary’s Review: What an exciting fun way to learn! Even I learned things about turtles I didn’t know. Turtles are wonderous creatures to say the least but to learn that they can live to be one hundred years old, don’t have teeth, can lay from one egg to one hundred eggs, can weigh hundreds of pounds…WOW! The photographs are fantastic and educational. I recommend this book for ages 5-12. About the Authors: Mary Hill is an award-winning writer and the former director of a regional history museum. Her husband Stewart Hill is a paleobiologist who has collected fossils as far north as the arctic circle. He is also the former director of a nationally accredited science museum and learning center.